In collaboration with our partners, Sentry Medical strive to exceed our clients expectations. Sentry Medical is the key distributor in Australia for some of the most well known and technologically advanced companies around the world. These partnerships have been handpicked and developed to enhance Sentry Medicals product range in areas where our partners are the absolute experts, to ultimately meet the needs of our customers. These include organisations such as Primed, Bolsaplast and Interster. All products distributed and sold by Sentry Medical meet and or exceed stringent Australian quality standards. Sentry Medical and Bolsaplast have been in partnership since 2007, providing quality bags and rolls for sterilization in places such as Hospitals, General Practice, Dental Surgeries, and anywhere where applications of Sterilization Packaging is required. Their production line is focused in manufacturing, printing and making of pouches/bags and plastic films. business: a direct and personal contact between us and the customer, as well as a specific customer attention for all of them. Quality is absolutely essential. Offering high quality products, which produce consistent seal integrity during manufacturing. Quality and service are a winning team in our company, increasing our competitive advantage. Bolsaplast is certified ISO 9001-2015 and fulfil control and manufacturing procedures specified. Sentry Medical and Interster have been in partnership since 2007, providing quality products that play a role in all stages of the CSSD process: cleaning, disinfection, packaging, sterilization and storage. Both Sentry and Interster’s extensive knowledge and experience in all these fields can offer assistance to many hospitals to optimise the quality of the CSSD processes. Interster has built a solid reputation in the international healthcare market for sterilization monitoring products and sterilization packaging material. Based on a philosophy of strong commitment to customer service and excellence in innovation, Interster has proven to be a reliable partner for CSSD and OR products. Levtrade have been in partnership with Sentry Medical since 2011. Levtrade International (Pty) Ltd was founded in 1990 with the primary idea of providing an effective and efficient method of treating burns in the acute (emergency) phase. A burn is a unique injury – one of the most severe and painful injuries imaginable. Burnshield® Emergency burn care products provide for the immediate primary care of burn injuries. Introduction of Burnshield® burn dressings focused on the emergency treatment of Burns. Trials conducted in Hospitals and the Emergency Medical Services soon provided the endorsements and acceptance of the Medical profession. These endorsements, coupled with internationally accepted independent laboratory tests, research and acceptance in key Hospital & EMS protocol, paved the way for the development to all sectors of the market and led to the introduction of training & educational items to compliment the range. As Burns happen anywhere and at any time, the product is used and sold to the Consumer, Industrial, Military, Police\Traffic, Correctional Services, First Aid Kit Manufacturers, Hospital & EMS\Fire departments. The Fire Trauma Blanket developed and designed with the Wool Board and the Council for Scientific Research (CSIR) found a ready market in the Emergency Services field where it is used as entry\escape to\from fire areas, to extinguish flames on a burning victim and to act as a large dressing providing instant pain relief. 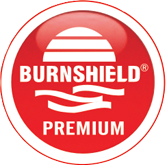 The production of Burnshield® is carried out in our sophisticated factory, Burnshield (Pty) Ltd, under the supervision of Managing Director Max Di Domenico. Here clinical areas and controlled air environment ensured the award of ISO 9001, ISO 13485 and CE (European) mark registration, the guarantee of quality production to the highest European Standards. Burnshield has FDA (USA) and TGA (Australia) approvals to market. Sentry Medical and PriMED Medical Products Inc. have been in partnership since 2001, providing quality face masks for distribution throughout Australia. PriMED Medical Products Inc. is a leading designer, manufacturer and marketer of high quality single-use disposable face masks. In an exciting dynamic environment of continuous change the PriMED advantage remains consistent and clear – Manufacture, Deliver, Protect.